Portrait of American painter Grace Hartigan (1922 - 2008) as she poses beside one of her works in her lower east side studio, New York, New York, 1957. (Photo by Gordon Parks/Time & Life Pictures/Getty Images). 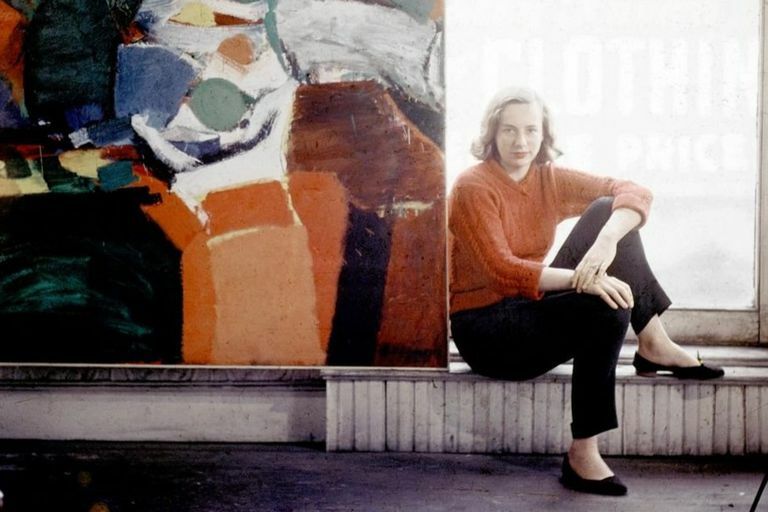 American artist Grace Hartigan (1922-2008) was a second-generation abstract expressionist. A member of the New York avant-garde and a close friend of artists like Jackson Pollock and Mark Rothko, Hartigan was deeply influenced by the ideas of abstract expressionism. However, as her career progressed, Hartigan sought to combine abstraction with representation in her art. Although this shift garnered criticism from the art world, Hartigan was resolute in her convictions. She held fast to her ideas about art, forging her own path for the duration of her career. Grace Hartigan was born in Newark, New Jersey, on March 28, 1922. Hartigan’s family shared a home with her aunt and grandmother, both of whom had significant influence on the precocious young Grace. Her aunt, an English teacher, and her grandmother, a teller of Irish and Welsh folk stories, cultivated Hartigan’s love of storytelling. During a lengthy bout with pneumonia at age seven, Hartigan taught herself to read. Throughout her high school years, Hartigan excelled as an actress. She studied visual art briefly, but never seriously considered a career as an artist. At age 17, Hartigan, unable to afford college, married Robert Jachens (“the first boy that read poetry to me,” she said in a 1979 interview). The young couple set out for a life of adventure in Alaska and made it as far as California before running out of money. They settled briefly in Los Angeles, where Hartigan gave birth to a son, Jeff. Soon, however, World War II broke out and Jachens was drafted. Grace Hartigan found herself once again starting anew. In 1942, at age 20, Hartigan returned to Newark and enrolled in a mechanical drafting course at Newark College of Engineering. To support herself and her young son, she worked as a draftsman. Hartigan’s first significant exposure to modern art came when a fellow draftsman offered her a book about Henri Matisse. Instantly captivated, Hartigan knew right away that she wanted to join the art world. She enrolled in evening painting classes with Isaac Lane Muse. By 1945, Hartigan had moved to the Lower East Side and immersed herself in the New York art scene. Grace Hartigan (American, 1922-2008), The King is Dead (detail), 1950, oil on canvas, Snite Museum of Art, University of Notre Dame. © Grace Hartigan Estate. Hartigan and Muse, now a couple, lived together in New York City. 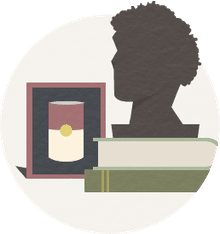 They befriended artists like Milton Avery, Mark Rothko, Jackson Pollock, and became insiders in the avant-garde abstract expressionist social circle. In 1948, Hartigan, who had formally divorced Jachens the year prior, split from Muse, who had become increasingly jealous over her artistic success. Hartigan solidified her standing in the art world when she was included in "Talent 1950," an exhibition at Samuel Kootz Gallery organized by tastemaker critics Clement Greenberg and Meyer Schapiro. The next year, Hartigan’s first solo exhibition took place at the Tibor de Nagy Gallery in New York. In 1953, the Museum of Modern Art acquired the painting "Persian Jacket" – the second Hartigan painting ever purchased. The pseudonym caused some awkwardness as Hartigan’s star rose. She found herself discussing her own work in the third-person at gallery openings and events. By 1953, MoMA curator Dorothy Miller inspired her to drop the “George,” and Hartigan began painting under her own name. By the mid-1950s, Hartigan had become frustrated with the purist attitude of the abstract expressionists. Seeking a kind of art that combined expression with representation, she turned to the Old Masters. Taking inspiration from artists such as Durer, Goya, and Rubens, she began to incorporate figuration into her work, as seen in "River Bathers" (1953) and "The Tribute Money" (1952). Undeterred, Hartigan continued to forge her own artistic path. She collaborated with close friend and poet Frank O’Hara on a series of paintings called "Oranges" (1952-1953), based on O’Hara’s series of poems by the same name. One of her best-known works, "Grand Street Brides" (1954), was inspired by the bridal shop display windows near Hartigan’s studio. Hartigan won acclaim throughout the 1950s. In 1956, she was featured in MoMA’s "12 Americans" exhibit. Two years later, she was named the “most celebrated of the young American women painters” by Life magazine. Prominent museums began acquiring her work, and Hartigan’s work was shown across Europe in a traveling exhibition called "The New American Painting." Hartigan was the only woman artist in the line-up. In 1959, Hartigan met Winston Price, an epidemiologist and modern art collector from Baltimore. The pair married in 1960, and Hartigan moved to Baltimore to be with Price. In Baltimore, Hartigan found herself cut off from the New York art world that had so influenced her early work. Nevertheless, she continued to experiment, integrating new media like watercolor, printmaking, and collage into her work. In 1962, she began teaching in the MFA program at Maryland Institute College of Art. Three years later, she was named director of MICA’s Hoffberger School of Painting, where she taught and mentored young artists for more than four decades. After years of declining health, Hartigan’s husband Price died in 1981. The loss was an emotional blow, but Hartigan continued to paint prolifically. In the 1980s, she produced a series of paintings focused on legendary heroines. She served as director of the Hoffberger School until 2007, one year before her death. In 2008, the 86-year-old Hartigan died of liver failure. Hartigan’s statements speak to her outspoken personality and unflagging pursuit of artistic growth. Curtis, Cathy. Restless Ambition: Grace Hartigan, Painter. Oxford University Press, 2015. Hartigan, Grace, and La Moy William T. The Journals of Grace Hartigan, 1951-1955. Syracuse University Press, 2009.